Hey, Hey! It’s a Good Day! Things are looking up around these parts. I’ve been waiting for this glorious day, after a rather unfun winter and spring. Of course, it isn’t that the entirety of those seasons were a bummer, but you know what I mean. When I think back later, on the winter and spring of 2015, they will likely not receive any honorable mentions as particularly outstanding times in my life. And that’s okay, because life isn’t supposed to be a nonstop feel good session, and the cruddy times are undeniably essential to truly appreciating the good times. It’s just the little things. Work is about to finally let up for the hubs, as he emerges from his busiest, craziest time of year. I’m almost done with an editing project I’ve been doing from home for several months. While we are both certainly grateful for his job and my contract work, it is going to be AH-MAY-ZING to be finished right around the same time. Then…downtime. Our plans so far include spending time together as a family, and just being. 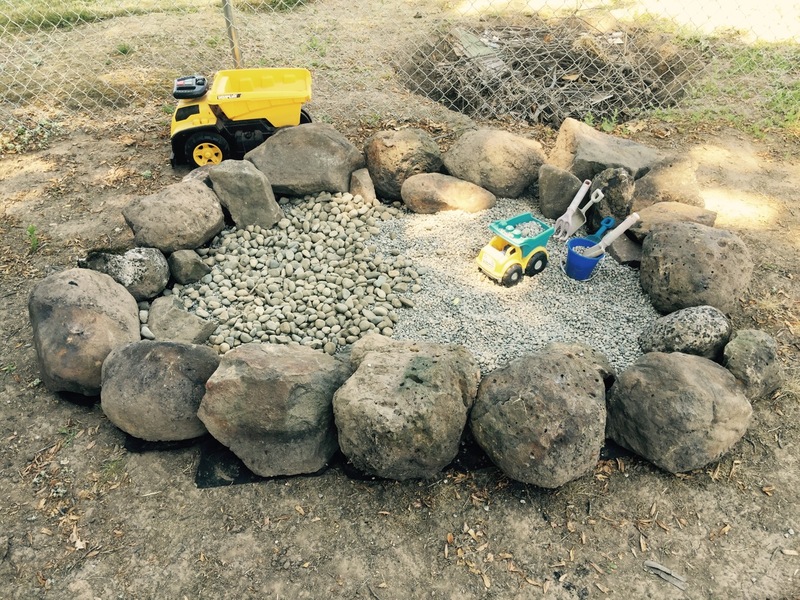 We set up a play set in the backyard this year now that E is old enough to enjoy it, and well as a “construction site.” The construction site was crucial because he kept going into the dog yard with his dump trucks and hauling out gravel to spread hither and yon. This included gravel in the grass and gravel in the flower beds and gravel sliding under my feet on the patio. It was only a matter of time before wayward gravel injured someone, probably me. Behold, the mighty construction site. To me it’s a pile of rocks, to E it’s a magical wonderland. Oh to live life through the eyes of a three-year old! My kid is easy to please. I fear for the day he starts hounding us for expensive toys and nonstop trips to cool places and the latest in footwear. I assume that’s all coming. But for now, I’m pretty psyched that his list is easy-peasy. Luckily, from where we live you could be in the mountains and at the beach, on the very same day, if you so desired. And elephants aren’t too hard to find when you have an excellent zoo 45 minutes away! It isn’t as if we have to go on safari to find one. I know I’ve turned a corner because although there are no new adoption prospects in sight, I find that no longer fills me with sorrow or fear. Those feelings have been replaced with patience (gulp) and a kind of underlying excitement that it will happen eventually. I’ve gotta give all the props to God on this one, because I asked him to take this burden from me and allow me to just live life focusing on the things I can do something about. And He did! You can’t beat the feeling of having your prayer answered before you’ve even said Amen!